The Georgia Department of Education and the Governor’s Office of Student Achievement released 2018 finance star results on January 24, 2019. Finance stars are calculated using each school’s or district’s per pupil expenditures, converted to a percentile rank, compared to their CCRPI score (school performance rating). See this page for details. Finance star results have been added to the state’s CCRPI portal. We do not compare CCRPI to expenditures in this blog post because CCRPI is correlated with school poverty rates1. Instead we graph per pupil spending against average Beat the Odds scores (BTO) in the visual below. Beat the Odds measures how a school performs on CCRPI compared to other schools that serve similar students. For example, a BTO score of 2 indicates that a school’s CCRPI is two points higher than the average CCRPI of similar schools. See this post for more detail on BTO. The visual shows districts that have at least ten schools. Atlanta Public Schools has the highest per pupil expenditure of these districts, at $15,322 and the next highest district is Clarke County at $11,713. Atlanta also has a relatively high BTO score of 3.2. Click on a district to see a history of spending and average BTO. Spending per pupil from previous years is adjusted for inflation to 2018 dollars. Use the “Schools” filter to change the minimum number of schools required. When all districts are included, two districts have higher spending per pupil than APS: Taliaferro County and Quitman County. These districts have 163 and 312 total students, respectively. Having very few students tends to raise per pupil spending due to some minimum costs, like having at least one principal, and due to small class sizes. There is not a significant relationship between spending and performance in this visual. This is often true of academic studies on the topic that use point in time correlations. However, studies using causal inference methods such as natural experiments tend to find a positive relationship. See this paper by Kirabo Jackson for more information. The per-pupil number excludes certain expenses not associated with instruction, such as construction, debt service, and food. See pages 5-7 of the calculation guide for a full list. For APS, if all funds are included, the total 2018 budget was about $1 billion, which works out to $19,176 per student2. The finance star per-pupil number for APS does include unfunded pension costs3. Excluding this would reduce APS’s PPE by about $1,000. APS has similar millage rates to other metro districts but has a larger tax base relative to student population for two reasons. As the center of the Atlanta metro area, APS has a large tax base from commercial buildings, but many of the employees in these buildings do not reside in the city, so their children go to school in other districts. Second, the age distribution of the Atlanta population shows we have relatively less people ages 5-18, and more people ages 19-30, compared to other metro counties. This is consistent with young adults living in the city then moving to the suburbs to raise children. The finance stars data also includes per pupil spending at the school level. To calculate school-level spending, in addition to each school’s allocation, GADOE divides centralized district costs proportionally to the schools. To calculate school-level spending for district charter schools, GADOE uses each schools’ allocation, plus 3% to represent services received from the district. For more information, see page 8 of the calculation guide4. The visual below shows APS elementary school spending per pupil graphed against student enrollment. Small schools tend to have higher spending per pupil due to having more required staff positions per student. For example, most elementary schools have one principal and one assistant principal regardless of size. Also, class sizes are often smaller at small schools because if a school has just enough students in a grade level to get an extra teacher, this has a greater effect on average class size in a small school than in a large school5. Use the filters to change grade levels or districts. The unfunded pension expenses described above are included in the budgets of traditional schools, but not charter schools. So traditional school per pupil expenditures are effectively about $1,300 lower than shown in the graph above. Per pupil expenditure at APS elementary schools ranges from $11K to $22K. However, much of the variation is explained by a few factors. Student enrollment explains 45% of the variance in per pupil expenditure for elementary schools. If we remove charter schools6, student enrollment explains 68% of the variance in per pupil expenditure at the elementary level. Per pupil expenditure is also influenced by the percentage of special education students and students in poverty. 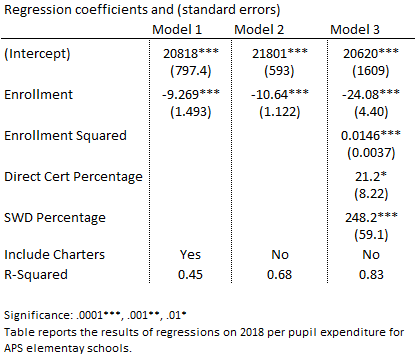 The regression table below shows that including these variables, and a squared term for enrollment, explains 83% of the variance in per pupil expenditure at the elementary level. Some of the remaining variance is likely explained by the type of disability served at school-based regional units, and by other special programs. The median elementry school enrollment in APS is 452 students and the median in Georgia elementaries outside of APS is 585. The enrollment coefficients above show that expected spending in APS is about $1,200 per pupil less on a school with 585 students than one with 452. This suggests that some of the additional per student expenditures in APS relative to other Georgia districts is spent on having smaller average school size. The FY2018 school allocations, visualized above, were mostly determined by staffing allotments. APS school budgets for FY2019 were built with student-based budgeting, which that means money is allocated based on the number of students and their needs, instead of based on the number of staff. So we’ll likely see a different relationship between per pupil expenditures and school characteristics when the FY2019 data is released. See here for more detail on APS’s student-based budgeting. Much of CCRPI is based on Milestones achievement. See this post for the relationship between Milestones and poverty rates. $999,963,046 / 52,147 students = $19,176 per student. This also includes preK students and budget, which the finance star data does not include. The magnitude of this cost is unique to APS. See page 37 here for more details. The district-level and school-level numbers published by GADOE in the finance star data do not match those published by our finance department, because our finance department does not use the same non-instructional exclusions as GADOE (and these exclusions are specific to the finance star calculation), and does not use the formula for allocating centralized costs to schools. As an example, if 30 is max class size, 31 students in a grade level would require two teachers, while 121 (4×30+1) students would require five teachers. The first case results in an average class size of 15.5, while the second is 24.2. APS charter schools use a different funding formula than traditional schools. See here for details.